Most everyone who comes to this blog knows I live in Central Florida. Orlando, to be precise. Hurricane Irma is supposed to hit Florida head on, but hurricanes are unpredictable and nobody really knows for sure what is going to happen. Currently the hurricane is directly over Cuba. In 2004, we sighed with relief when Charley went into the Gulf of Mexico. However, at Charlotte Harbor, Charley turned eastbound up the Peace River. My husband and his former souse were sitting in Orlando watching on the television as the eye of the hurricane moved over their investment home on the Peace River and leveled it. His boat ended up in his neighbor’s living room. Then, Charley headed north, and hit Orlando wide open. Charley was small, fast and furious, cutting a path across the state before heading back into the Atlantic on the other side of the state. When it hit the Gulf, all of Central Florida had let down their guard. Tornadoes were spawned in Charley’s wake. So there was much devastation across the state. In 2004, I had never experienced a hurricane. That night, I was off work and sitting on my front porch talking to my dad on the phone while watching the huge oak trees across the street kiss the ground in the torrential rains. My little apartment was on the ground floor of a two-story cinder block building on the NW side of town and I felt safe. Little did I know that the SE side of town was ripped apart near the airport. I never lost power, so I had hot water and air-conditioning. But I was most fortunate, most were without power for nine days. Early the next morning I was called into work. As an RN I was considered first responder during Charley and our employers made nurses stay at work 24/7….could not even go home to shower and had to sleep in patients rooms on the floor. I mean we chose that job…but that’s how it was. I lived five mins away and off the night of the hurricane, but was called into work that morning and had to show the police my “Disaster Preparedness Team” papers to be able to be on the interstate. I was in College Park and worked off Michigan. After 16 hours of work, they wanted me to sleep on the floor in a patient’s room because we received a huge amount of patients that had been evacuated from a facility in Lake Wales that had lost its roof. They let me go home for 8 hours, but I had to sign a paper agreeing to be back when I said I would….or risk termination. We lost a lot of patients during that time. The Nursing Home was without power for nine days. The backup generator only supplied a few room’s outlets. The oxygen concentrators are electric, and once we ran out of O2 tanks, people started dying. We saved more than we lost, but people were literally dying in the hallways. A van of nurses came from Lake Wales to help take care of their patients every day. A couple of days after Charley went thru, the van was involved in a terrible accident in the torrential rain and two nurses were killed and one was paralyzed for life. I don’t think non-essential employees should be mandated to stay on their jobs during such a crises. But it’s crazy here and people can be fired for leaving a job at McDonald’s. Unless they live in a mandatory evacuation area, they are expected to stay. Life is an adventure and then you die….seriously…we’ve been helping people board up homes and secure pets for those that need to leave. Some of our friends have relatives on the coast that can’t drive any distance (elderly people) so they are going to get them and bringing them to Orlando…I actually feel safer here in Central FL than anywhere else in FL at the moment. In the aftermath of Charley all you could smell when you walked outside was Bar-B-Q. People were grilling meats that had thawed and was one big party from backyard to back yard…lol It was quite an experience. Free food everywhere….people helping cover rooftops with tarps. Chainsaw sounds were deafening. But here is the real kicker: We just bought a house on Matlacha. 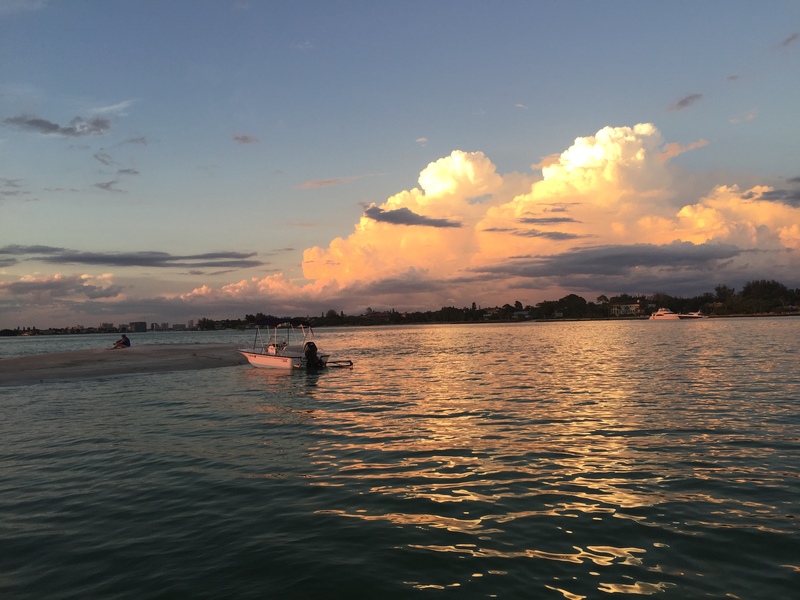 The island is basically a sandbar between Pine Island and Cape Coral in the Gulf of Mexico, just behind Sanibel Island. Pine Island is a conservation island where no more development is allowed…no big condos, hotels or big box stores. Matlacha (pronounced Matt-la-shay) is that tiny red island. The homes are three feet above sea level…the quaint bungalow we hope to retire to is on a lot that is built up by about 6 feet, and Irma’s storm surge is expected to be 6-10 feet. The Key Westy home is surrounded by coconut trees and sits on a deep water canal just a few yards from the channel that runs wide open to the Gulf. The home is waterfront with picturesque shuttered windows all around, opening views to the dock and the bay. Sanibel and the barrier Islands offer some shelter, but you just never know about these things. So there is that. Sure hoping the 1964 house will still be standing when all is done, and the island property is not on the bottom of the bay. It’s been there for more than fifty years, so all we can do is hope it can at least last another fifty years. At any rate, we have a generator for powering our a/c and fridge here in Orlando in case we lose power, and the family is gathering at our place to weather whatever part of the storm hits us here in Orlando Sunday night. There is still a sliver of hope that Irma will continue westward, but all hope of it turning north and heading up the eastern seaboard is gone at this point. It is currently bearing down on Cuba and when it hits the mountains it should weaken. The FL Keys are just starting to get hit with the outer bands, and they are warning them for Cat 3 with 105-125 winds with gusts to 145, and it’s not looking good for Matlacha. However, the house was built in 1964, has weathered many a storm, and we can hope to weather another half century. Battening down the hatches and riding out the storm! Nothing is more satisfying than getting away from the rush and crush that is city and deadlines. Most of my deadlines are self-imposed, but the pressure is heavy just the same. My best inspiration comes from getting out into the spaces that are quickly being overrun by modern society. We took off with the boat for the Gulf Coast. There’s a certain sort of serenity and peace that sweeps over you when you find yourself miles away from civilization and surrounded by nature that is usually unseen and often taken for granted. Like this huge sand bar at Big Pass off the coast of Siesta Key. 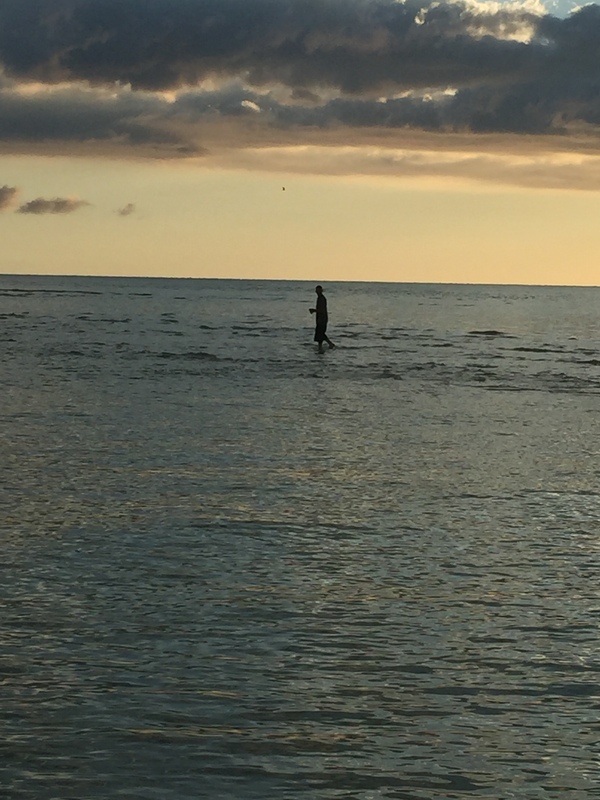 Our friend, Gabriel, walking on water. My husband spent his teen years here on the Key and it was pleasantly nostalgic for him and for me to share in his history there. We netted a few dozen soft shell blue crabs, which are in season now. They are scrumptious when lightly battered and deep fried. 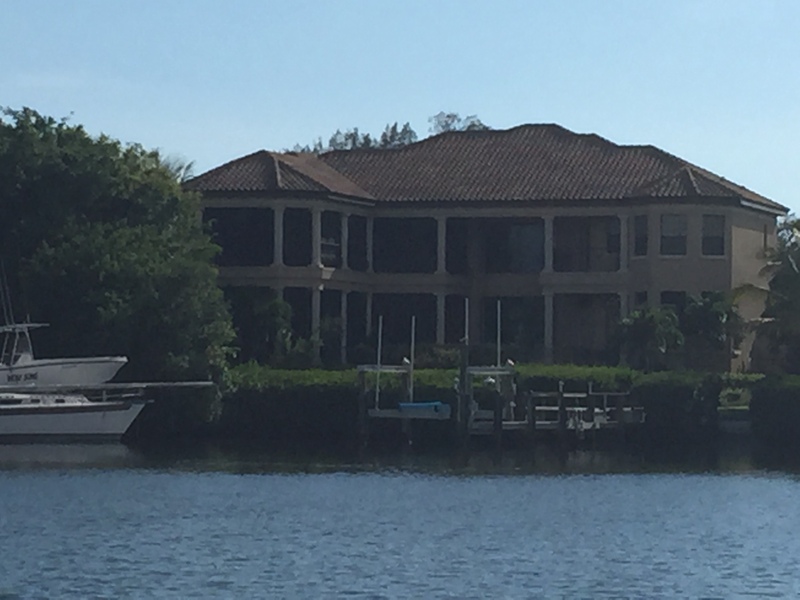 This next pic is the $10,000,000.00 house that was built on the lot that his father’s old house was bulldozed off of…funny thing is…you don’t need a ten million dollar house for the same glorious views you can get if you have a boat. There are a few 1950s hold-outs tucked between the $20,000,000 mansions here and there. The RS told us stories of his youth, streaking across his college campus, making the front page of the local paper and becoming airborne in his VW bug when topping a hill, only to fine the cops sitting at the foot of the hill when he landed. Willful and wanton reckless driving was the charge (following a few dozen more) that suspended his license and had him riding a bicycle to college, thirty-six miles round trip, for the rest of the semester. 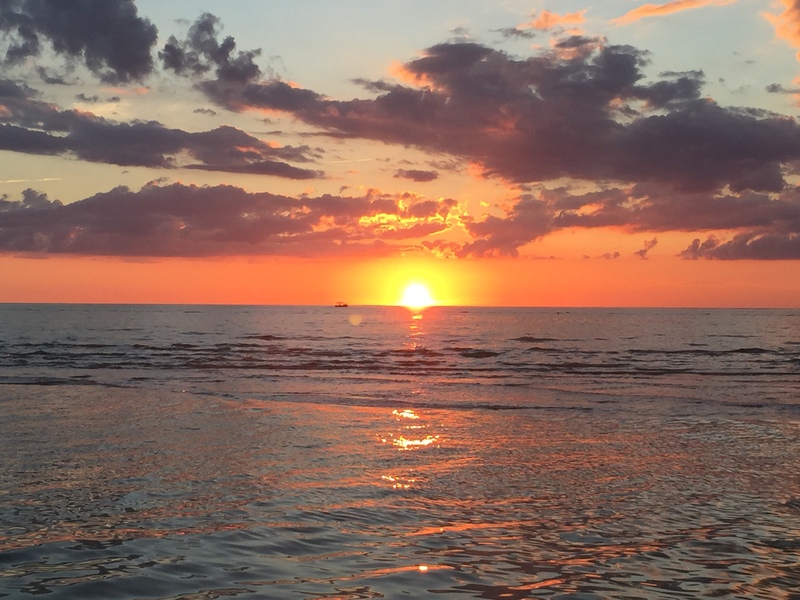 Many days he pulled his little skiff out to the sand bar and spent time alone absorbing the splendor of spiritual moments in tune with greater aspects of our universe…internal and external. We’re hoping to be able to leave Central Florida and move closer to the Gulf Coast when the RS retires. We try to spend as much time as possible over that way. 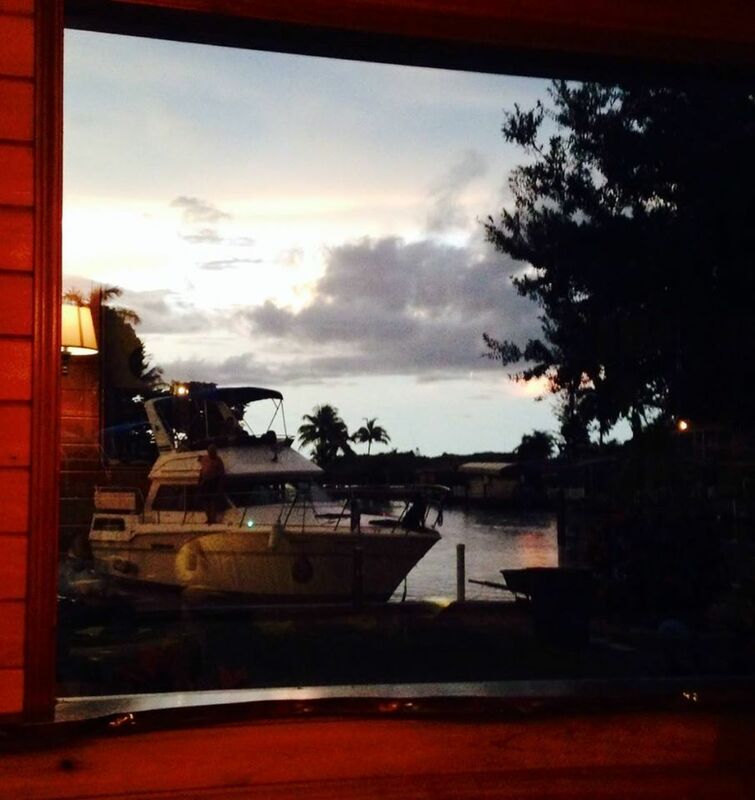 There have been some nice stays in top-of-the-line resorts, but our favorite thing to do is to find a little affordable waterfront hotel with no dress code and a quaint dockside marina where we can park the boat and chill for a few days with no worries. I look forward to days when the grandchildren are a little older and we can take them out and share the splendor of the area before it’s all spoiled. It’s getting harder and harder to find such places in Florida. Old World Florida is slipping away beneath the concrete of condos and high dollar establishments as New World Florida smothers the best the area has to offer. People pay big money to leave the massive condos for dinner tours to watch the sunset, and it’s becoming more challenging to find a spot to watch it undisturbed by all things modern and convenient. Sometimes giving up conveniences is just the prescription you need to get your head and your heart in order. But I have to admit, it’s nice to have a well tricked out boat with GPS and a depth finder. I kept telling myself it would not be right to posts about this, but I can’t help myself. We’ve been scammed. The RS posted our 1984 36 ft. cabin cruiser Sea Ray for sale on Craig’s list. We had several inquiries and a few who wanted to pay cash. The RS took the first cash offer. The original price was $11,500. After some haggling, he came down to $9500. The buyer insisted on a marine survey, which is customary. The surveyor told the buyer that we had a lien on the boat. The RS planned to pay off the lien with the proceeds, which is customary. The RS also dropped the price on the boat by another $300. for things the surveyor found that needed fixing. The buyer, Steve Shelton, gave the RS $1086.86 down payment to hold the boat. He wanted a notary present when the paperwork was signed. The boat was located nearly four hours from our home in Orlando, south in Lee County in Ft. Myers at the RS’s friend’s house, Jeff. Jeff’s wife wanted the boat gone ASAP. The RS drove back down there, where the buyer and the notary and the RS signed a bill of sale. The RS had told the man he needed a money order made out to the bank or a cashier’s check, but there was a lot of commotion and gyrations. The man had his wife, daughter, son-in-law and a kid with him. They were all complaining and accusing my husband of being dishonest for not telling them about the lien. That’s why my husband agreed to take the personal check. The buyer wanted to pay the RS the balance with a personal check, which he gave the RS. That was on a Saturday and the guy wanted to take the boat Sunday morning. When he got home, I turned him around and told him, no…he needed a money order or a cashier’s check or they would have to wait until they got one to take the boat. The daughter had wanted to take the boat Saturday night and wire the money on Monday morning to our bank. The RS drove back down there in the middle of the night, four more hours, in order to be there when they got there Sunday morning. Upon arriving, he saw the batteries were dead, drained by a malfunctioning bilge pump. The boat would not be safe to operate without one, so Jeff and the RS set about correcting the problems: recharging the batteries and replacing the bilge pump. The RS was working on forty-eight hours with no sleep and 1600 miles under his belt. When the man arrived with his son-in-law, wife, daughter and now two kids, the daughter was screaming that the RS had been dishonest again, and not told them about the problem with the boat. The RS explained that he was there to fix the problems and that he needed a money order or cashier’s check before they took the boat. On the Bill of Sale, the RS stipulated that a balance was owed of $8113.18 to be made payable to our bank and our account. The daughter was upset because her father and his wife had been living with her and she was supposed to get two more foster children the next day and her father needed to be out of her house and onto the boat which he planned to live aboard. She and the man’s wife went to purchase money orders which they said they bought a Walmart and mailed to our bank. They showed the RS the receipt stubs but did not give him copies. By five o’clock, the boat was repaired and the two men rode away from the dock with the boat toward Sarasota. The two women and two children left in a car. Three weeks later, our bank still hasn’t received the money/money orders. He still wouldn’t provide the requested documentation. We notified the FBI, as this a documented vessel with Homeland Security, and we could not get any local authorities to take any action. The FBI wrote back demanding that the local authorities take action or we were to notify the District Attorney. Suddenly, the Coast Guard is willing to post a note on our title and the Ft. Myers, Lee County authorities are ready to take a report, which has now been filed. 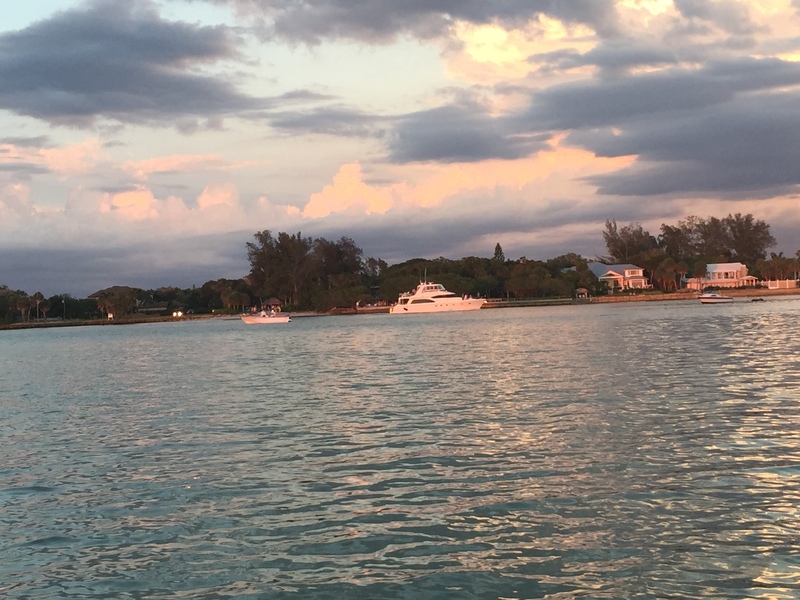 We hired an attorney who saw our boat in Sarasota Bay at an anchorage where derelicts live aboard vessels. The Sarasota police weren’t able to find it. So far, we haven’t heard back. So this is where my head has been all week. We should know something by the end of the week.